Chicago : The first comprehensive set of hospital-level surgical care standards for older adults has been released and published on the Annals of Surgery website in advance of print publication. The report, “Hospital Standards to Promote Optimal Surgical Care of the Older Adult,” is the culmination of a two-year evaluation, performed as a modified RAND-UCLA Appropriateness Methodology by the Coalition of Quality in Geriatric Surgery (CQGS), a multidisciplinary coalition representing the American College of Surgeons (ACS) and 58 diverse stakeholder organizations committed to improving the quality of geriatric surgical care with support from the John A. Hartford Foundation. These preliminary standards reflect the shift toward interdisciplinary care of surgical patients, while taking into account the unique physiological changes related to aging and chronic diseases that can sometimes leave older surgical patients at risk for complications after an operation. Since it formed in 2015, the CQGS has been collaboratively working to develop a national framework to improve the quality of surgical care for older adults. Because no such infrastructure currently exists, geriatric surgical care is too often delivered in a fractured health care system not readily prepared to address an aging population. And yet this vulnerable population is on the rise, with older Americans likely to become surgical patients in the coming years. More than 40 million adults 65 years and older are living in the US, and that number is projected to grow to 24 percent of the population by 2060 from 15 percent in 2015 according to the U.S. Census Bureau. Further, the Centers for Disease Control and Prevention reports that of the 51.4 million procedures performed in 2010, 38 percent of the patients were 65 years and older. The new geriatric surgical care standards build on already existing quality indicators, National Quality Forum-endorsed quality measures, and previous work by the American College of Surgeons, American Geriatrics Society, and John A. Hartford Foundation, which have already collaboratively developed and released two sets of perioperative care guidelines. For the Annals study, an initial 2015 CQGS stakeholders conference identified care gaps for older surgical patients and ideal future solutions across four areas: goals and decision making; perioperative optimization, clinical perioperative care, and care transitions. These categories provided structure for the preliminary standards. Through the use of a modified-RAND-UCLA Methodology, stakeholders rated these candidate standards during a second stakeholders conference in May 2016. “The methodology used is a validated technique for putting together the best level of published evidence with the input of thought leaders in the field, giving us a useful combination of efficacy, effectiveness, feasibility, and implementation,” said Clifford Y. Ko, MD, MS, FACS, study coauthor and CQGS Co-Principal Investigator. Continuum of Care, encompassing patient-centered goals and decision making, perioperative optimization, and transitions of care. Clinical Care, encompassing the phases of immediately preoperative, intraoperative, and postoperative care. Program Management, encompassing personnel and committee structure of a geriatric surgery program, and credentialing and education standards for hospital personnel who care for older surgical patients. CQGS stakeholders reviewed and rated the 308 proposed standards of care for both validityand feasibility. The stakeholders rated 306 of 308 (99 percent) of the standards as valid to improve the quality of geriatric surgery, and 94 percent of the standards (290 out of 309) as feasible for implementation. Although the end goal is to implement these CQGS standards in a formalized verification and quality improvement program through the ACS, there is still more work to be done. The preliminary standards are currently undergoing a two-phased pilot process. “Now that we’ve confirmed what high-quality surgical care for older adults should look like, we’re ready to evaluate how these standards will work in a hospital environment. This is an important aspect of the project, and the feedback portion from hospitals is vitally important,” said Ronnie Rosenthal, MD, MS, FACS, CQGS Co-Principal Investigator. The alpha pilot phase launched in January and is in now in final stages. Fifteen end-user hospitals* reviewed the standards to provide feedback to CQGS on anticipated challenges in meeting the standards, identifying unclear standards, and gaining insight on the value of implementing these standards in their hospital environment and with their patients. “Although feasibility of implementation may be a challenge for some hospitals, the CQGS continues to explore ways to make these standards flexible across different hospital settings, sizes, and resource levels. Our alpha pilot will elicit real-world feedback from frontline hospitals and providers about these standards,” Dr. Berian said. A beta pilot phase to follow in late 2017 will engage six hospitals to actually implement the standards for older surgical patients. 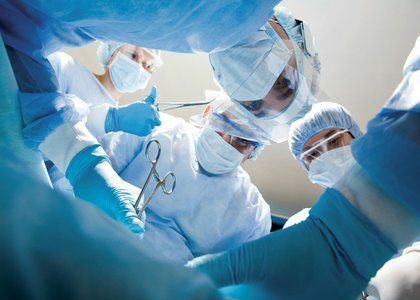 “More older people at increasingly advanced ages are undergoing surgery and it is critical that we move the evidence we have about good surgical care for this population into practice. These preliminary standards put a focus on outcomes that really matter to older people and their families, and are a monumental step forward. We are proud to support and partner with the American College of Surgeons on this important work,” said Terry Fulmer, PhD, RN, FAAN, President of The John A. Hartford Foundation. Once the pilot phases have been completed and a national verification program is available, participating hospitals will make the commitment to ensure that geriatric surgical quality is interconnected with a hospital’s quality and safety culture. Citation: Hospital Standards to Promote Optimal Surgical Care of the Older Adult. Annals of Surgery. DOI: 10.1097/SLA.0000000000002185.